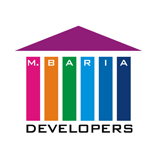 M. Baria Group consists of different entities under one roof among few of them is one of the partnership firm M/s Ameya Builders & Property Developers is registered under India Partnership Act, 1932 bearing registration no MA – 20072 dated 13/06/2000. It is in the Builders & Developers with the Activities of Acquisition, Purchasing, Developing and selling immoveable Properties, Construction of Building, Residential as well as Commercial complex alongwith infrastructural facilities like Playground, Swimming Pool, Club House, Garden, School, Hospital, Temple, Meditation Centre, Pond Community Hall etc. Since October 2003, Firm is currently working on the project “YASHWANT NAGAR” at Virat Nagar, Virar (W), Tal. Vasai, Dist. Thane. The Firm is a member of the Builders Association of Virar.